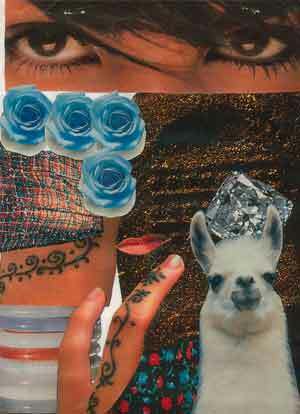 Directions: Using magazine photos, create a collage of images that symbolize important ideas, events, or themes in your book. On the back, explain what each image symbolizes and how it draws on key material from the character's experience. The example shown below is based on Shabanu by Suzanne Fisher Staples. Beauty is in the eye of the beholder. That beautiful pair of eyes gazing at you from the top of this page signifies perspective. This book was written through the eyes of a rambunctious teenager living in a world quite unlike our own. The way Shabanu deals with her problems and perceives her feelings is represented in the diamond because its beauty shines from the center of a rock like Shabanu. She has so much beauty in her heart but she saves some of it inside where no one can reach it. In the background is a footprint in the sand, showing not only the terrain that Shabanu lives in in Pakistan, but also the footprints she has to follow. Her ancestors long ago made these prints and everyone is forced to follow. The mouth located in the middle of the collage represents the fact that Shabanu is not afraid to speak her mind. The sparkly shirts represent the wedding of Phulan to Murad. All the relatives of the bride dressed up in beautiful mirrored skirts and shawls. Blue flowers were placed in clumps at the top of the page because they show the four experiences that Shabanu endured and also show that there was a shadow left behind that will always be with her. The loss of Guluban, the loss of Murad, her betrothal to an older man, and her final scheme to run away are the experiences that the roses represent.